Rome was neither built nor disassembled in a day. While historians point to September 4, 476—the overthrow of the last empero—as the date it all fell apart, the fall really began decades earlier and continued for decades afterwards. This would be an easy story to tell if it was simply a matter of the better tech winning. But it’s not. Plasma still beats LCD on almost every measure of picture quality. The excuse for most flat panel purchases is the Super bowl, and plasma is unquestionably the better Super bowl TV. It’s extremely fast screen response rate means it can show fast motion crisply, and it’s wide viewing angle means that even the latecomers at the edge of the room see a bright image of the game. Say you’re more a cinephile than sports fan? Plasma is the best choice for movies, too. It produces far better contrast, which renders richer detail—especially in the kinds of dark scenes that are common in many movies. And while the best LCDs deliver very rich color, the cheapie LCDs that most people buy are probably no match for even bargain plasma. The one real negative for plasma is power consumption. But even that’s improving. While the average plasma uses about 17 percent more power as an LCD of the same size (according to Cnet), Panasonic has just introduced new screens called “NeoPDP” that use half as much juice as earlier plasmas. Next year’s versions are expected to cut that down to one third as much. And even the eco-record is mixed. Most LCD TVs contain mercury-laden fluorescent lamps. So what’s wrong with plasma? It’s just not cool anymore. Having been the first large-screen technology, it now seems old. LCDs are the shining future—literally, as they are quite a bit brighter than plasma panels. Nevermind that LCDs are bright enough to give you a sunburn, and you have to turn them down to make the screen tolerable to look at. Big numbers sell. LCD wins on the brightness number and also usually on resolution. You can find a “1080p” LCD (with a resolution of 1920 by 1080 pixels) screen as small as 32 inches. At that size, you’re unlikely to actually see the benefit of the extra pixels, but it’s nice to know you got more for your money. Meanwhile, most 42-inch plasmas (the most common size) have a sub-high-def resolution of 1024 by 768 pixels. Regardless of how it looks, it just doesn’t sound good. I’m not, by the way, a plasma partisan. With my small budget and small apartment, I had no room for a giant screen. Instead of plasma, I bought a 37-inch LCD TV on closeout. The picture quality is lousy, but the size and price were right. And since I mainly watch Internet downloads, the screen is not the quality bottleneck, anyway. 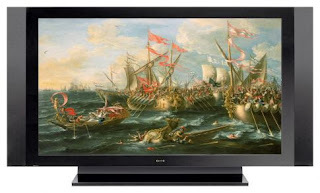 Plasma may survive the Fall as a niche product for Blu-ray-equipped video aficionados—just like Latin remained the language of choice for the small number of educated people during the Middle Ages. But it looks like LCD has breached the walls, deposed the monarch, and installed itself as our new TV overlord. Want to read more articles like this, plus stories on gaming, music, movies, and more? Subscribe to Popular Science and get 83% off the cover price!